When Jessica died I was devastated and the midwife at the hospital didn’t know what to say to me. At the time I was given 13 booklets, one which was 67 pages long. I could barely read five words, let alone read and digest such a long publication. When I did read it I discovered some of the content was not relevant to us, or it was too late for us to use, and was just too much to take in. 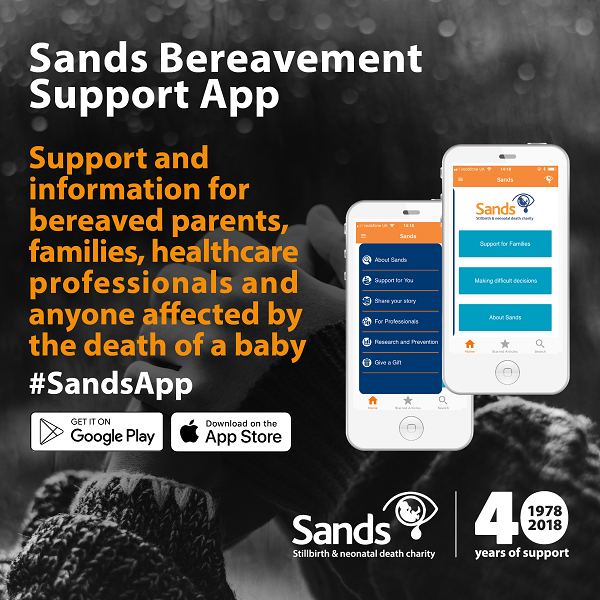 Shortly after we lost Jessica I contacted Sands to let them know that searching for information was difficult and overwhelming for bereaved parents at the time of a baby’s death. In a digital age we discussed my idea of creating an app that can be downloaded in seconds that provides all the information a bereaved parent and their family would need anytime, anywhere. I previously worked for a global business and technology consultancy and submitted my idea to them as one of 20 global project submissions to utilise our key skills. I was so happy and humbled that my idea was chosen, developed out of a personal need and finally granted. The Sands app . . . will be an aid to current bereavement care in the UK. Nicole has been nominated as part of 40 volunteers for #Sands40. Join them at Sands 40th Anniversary Conference on 17th November 2018 in Glasgow.